The Heritage Carousel has provided smiles to thousands of people since it first started going in circles in 1998. It is operated under the Des Moines Carousel Foundation, a non-profit organization, and provides about 45,000 rides during a typical season, although in the 2009 season over 59,000 rides were given! Owned and overseen by a volunteer board and a part-time director and seasonal assistance, it was established to provide an affordable, wholesome and nostalgic family based activity. It is located in a working class section of Des Moines and hosts riders from all over the metro area and Central Iowa, as well as those who travel to see authentic carousels across the country. 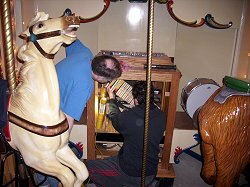 This turn-of-the-century replica carousel is hand carved from basswood, hand painted and ridden to the sound of an old-fashioned band organ. Through this the Heritage Carousel supports a nostalgic and unique aspect of the past whose availability dwindled during the depression. The carousel itself is a beautiful work of art displaying the heritage of Des Moines and surrounding communities through painted portrayals of buildings and sites of significance to these communities. The concept of a carousel located in a public park was initiated by J.C. ‘Buz’ Brenton who proposed the idea and supported it financially along with spearheading other private funds to purchase the Carousel. Working with the City of Des Moines, the location in Union Park was chosen. After two seasons a permanent pavilion was built to house the Carousel. The pavilion was built with city and private funding. The foundation enjoys a positive relationship with the City and a City representative serves on the foundation board. The City does assist with minor needs of the Carousel and pavilion. The main goal of the foundation is to offer a magical and simple bit of fun to a child for the very affordable price of just fifty cents. Providing affordable family activities is an important element of a community. The Carousel is established in Union Park because of its space and location in a working class district of Des Moines. Although the park is well used by the neighborhood it offers activities that attract users from the surrounding metro areas and Iowa. The Carousel hosts schools, weddings, birthdays, company gatherings, reunions and carousel lovers who travel across the nation viewing authentic carousels. Bringing families to the park to enjoy themselves and the outdoors is an important aspect of its existence. 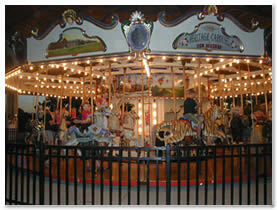 To keep the Heritage Carousel affordable ridership must be subsidized by private rentals, sponsorships and donations. A thank you event providing free rides, music and refreshments for volunteers who assisted with the 2008 flood relief efforts. A Carousel inspired picnic table painting project, a collaborative project with the Boys & Girls Club, a local artist and the Iowa Arts Council. An opportunity to learn about how carousels are made by hosting two of the original creators of the Heritage Carousel to provide a day-long carving and painting demonstration. Over 1200 free rides were given that day as people learned about and enjoyed the fun and beauty of this carousel. The Iowa Arts Council, Sammons Annuity Group and a private donor provided for this project. A program providing free Carousel rides to clients at the Boys & Girls Club, Big Brothers/Big Sisters Program, Orchard Place and the emergency rooms and clinics at local hospitals who primarily serve a lower socio-economic clientele. 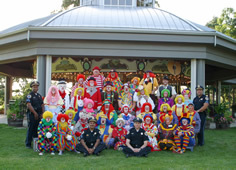 Carousel staff continues to be involved in helping with the coordination of the “Clowns at the Carousel” an all free family event attended by over 3,000 families each year and “Cruise to the Carousel” a relics car show that offers free viewing and free Carousel rides. Proceeds from this show benefit the Carousel each year. Both are community-oriented activities that bring thousands of people to the park annually. The Carousel regularly assists schools and non-profit organizations, such as social services and daycare programs, which request to use it by offering discount rentals and rides which helps their increasingly tight budgets. These users appreciate the Carousel as a way to interact and connect with their clients and to play, celebrate, teach and enjoy. Although the Carousel uses paid staff to operate, it has volunteer supporters who also assist. Volunteers also provide regular mechanical maintenance and assistance during high usage times and special events. Please feel free to Contact Us if you have any questions or are interested in supporting The Carousel!